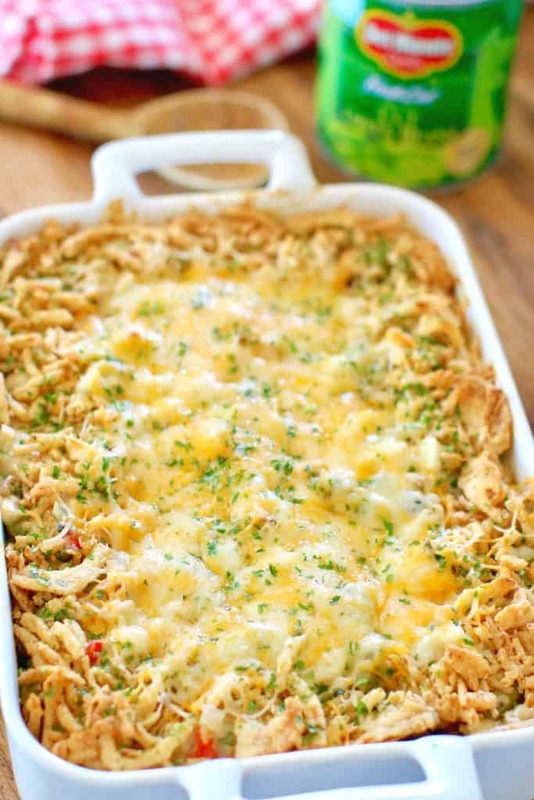 Green Bean Casserole…with a twist! I always have a lot of fun when I am challenged to come up with a recipe twist. It gets the ole creative juices flowing, and if I’m lucky, I get a new recipe to share with y’all. I teamed up with Del Monte® to re-imagine the green bean casserole. Now, we all love our favorite traditional recipe, right? But sometimes it’s fun to change it up (just a little) to surprise your friends and family with something they never knew they were missing out on! So I went with a recipe that will not only be good for your holiday meals but you can also add some ground beef to this and it becomes an easy weeknight meal. Boom! Del Monte® is launching a nationwide call for America to vote on their favorite holiday classic, the Green Bean Casserole. Visit Del Monte’s “Pick A Side” Sweepstakes on Facebook for your chance to win a #CasseroleCravings kit and $1,000 cash! So pretty please will you vote for this recipe? I don’t win anything but YOU might!! And I sure would love to have one of my Country Cook friends win! Cook’s Notes: O’Brien potatoes are finely diced potatoes, onions and peppers found in the freezer section of your grocery store near the hash brown potatoes. Use any cream soup you enjoy, such as cream of chicken or cream of potato. 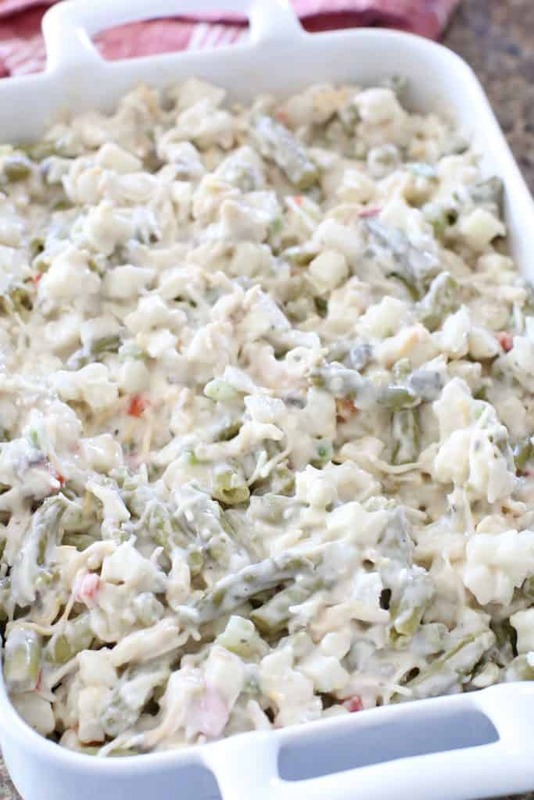 To make this side dish a meal, add 1 lb. cooked ground beef or ground turkey in Step 1. Preheat oven to 350°F. In a large bowl, whisk together soup, milk, garlic salt and black pepper. Stir in frozen potatoes, green beans, 1 1/3 cup onions and 1 cup cheese. Pour mixture into a 13×9-inch baking dish. Bake, uncovered, 30 minutes or until hot and bubbly. Sprinkle with remaining 1 cup cheese and 1 1/3 cups onions. 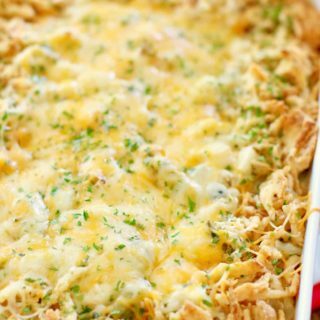 Bake 5 minutes or until cheese is melted and onions are lightly browned. Then serve! 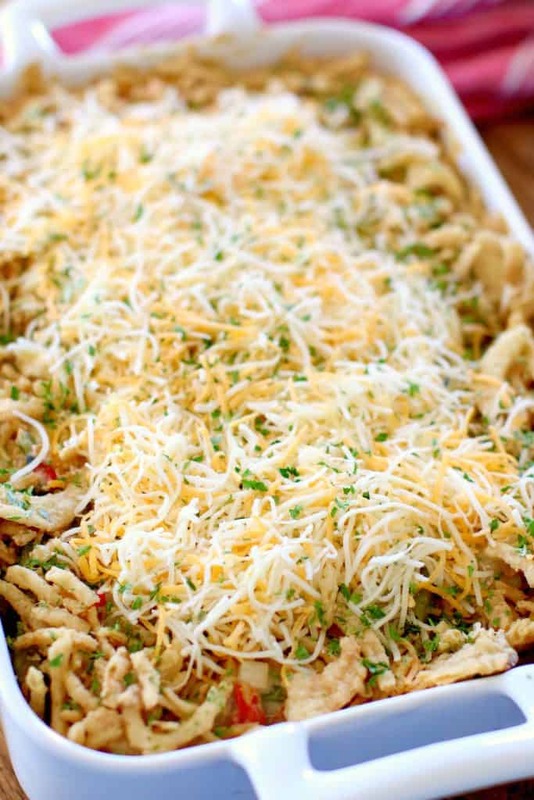 A perfect twist on the classic green bean casserole! Pour mixture into a 13x9-inch baking dish. Bake, uncovered, 30 minutes or until hot and bubbly. Sprinkle with remaining 1 cup cheese and 1 1/3 cups onions. 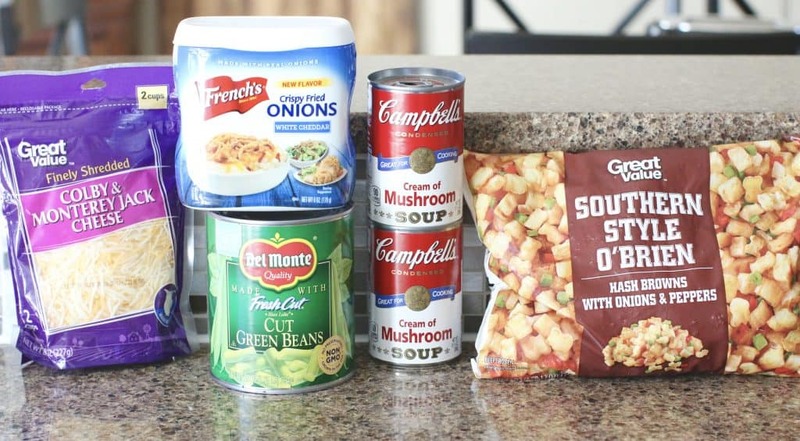 · O'Brien potatoes are finely diced potatoes, onions and peppers found in the freezer section of your grocery store near the hash brown potatoes. · Use any cream soup you enjoy, such as cream of chicken or cream of potato. 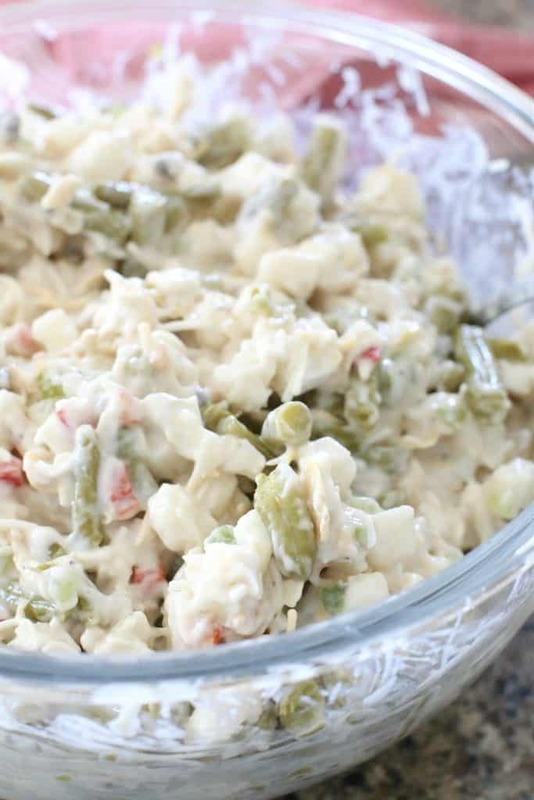 · To make this side dish a meal, add 1 lb. cooked ground beef or ground turkey in Step 1. What a great twist on a family favorite! We are going to have to give this a try! Thanks Carlee! Super easy and it combines two side dishes into one basically. Ha! Did you also sprinkle on some parsley with the cheese? Looks yummy. I’m going to try this! Yes! Just some dried parsley flakes to make it look pretty 🙂 Totally not necessary for taste though! 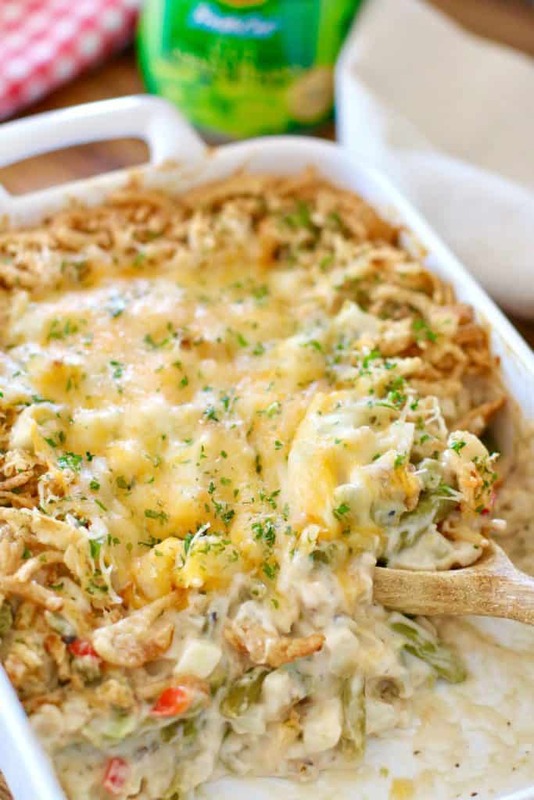 Not a huge fan of green bean casserole, but this looks great! Gonna give it a try for sure. My daughter never has liked green beans, so one year I changed it up and use broccoli florets instead. It’s great. Make it every year since. Sometimes I add chicken or turkey from thanksgiving or ham. Riki – that is so creative! This recipe is definitely going on my holiday dinner table this year for sure!! Thanks so much Marilyn! Hope you have a joyous Thanksgiving! Hello Brandie! I voted for you recipe I have made a couple of your recipes and they all been great! My family really enjoyed them!! Thanks so much Cindy!! Fingers crossed you win!! That sounds so good and I love green beans but my husband doesn’t ! But I am going to give it a try anyway! 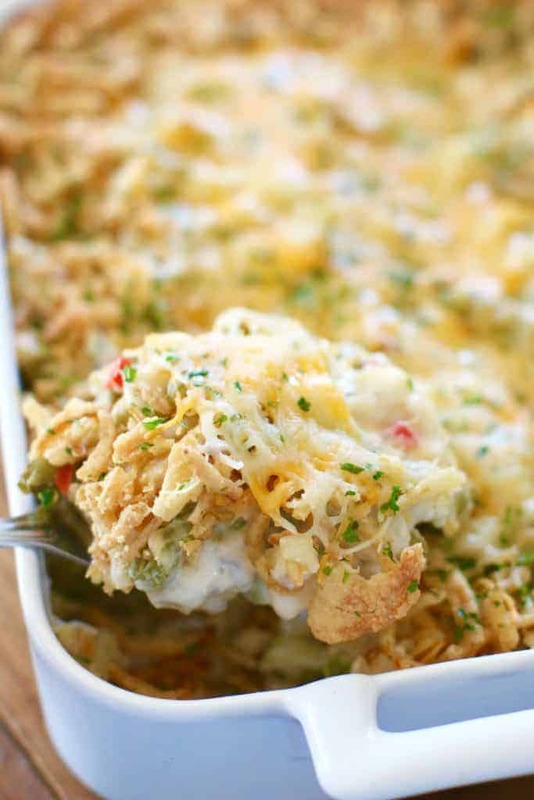 A nice twist to the holiday green bean casserole dish…will do! Thank you Valinda! I think it stays true to the original with just a small little twist. Hope you love it! Wow! Never thought to add frozen potatoes to this dish.what a great idea! I’m definitely going to give this a try. We have an Aunt and Uncle coming in from out of town to my Mom’s house for Thanksgiving this year and can’t wait to present this dish to them all!!! Thank you so much for the recipe.???? I hope everyone loves it Michelle! Hope you have a wonderful and warm Thanksgiving! What a great idea. With the upcoming rush of the Holiday season, a one dish potato & vegetable side dish ! Hmm definitely trying this..thanks..this and the brown sugar pie..what a blessing..discussions with various family members now ended up making a last minute decision to have Thanksgiving dinner here ..one at my sister in laws early noon and one here late afternoon ??????? ?and this was on my email..you are my guardian angel! Awww Peggy – I know all about those last minute plans! I’m honored that you would use these recipes to celebrate with your family! Happy Thanksgiving! I’m planning to make this for a pre Thanksgiving lunch at our church tomorrow. Just wondering if it would be ok to partially thaw the taters.before cooking. Don’t want the taters to over cook but want to make sure they’re well done. Thanks so much and I hope you and your family have a blessed Thanksgiving! Voted for your recipe. It looks really good. Love you’re blog. Awww thank you Barbara!! You are so sweet to come back and leave me a comment too! I made this for Thanksgiving last year and it was a big hit! Even the people that usually avoid green bean casserole tried it and loved it 🙂 I’ll be making it again this year. Hi Amanda – thank you! I sure do appreciate you coming back to let me know!!! Yay! I like the idea of this recipe. Am going to try it. Also like the idea of making it into a meal by adding ground beef. I was thinking of using diced chicken or left over turkey. I like recipes like this one that you can play with. I LOVE this recipe and have been making it for holidays for a couple of years now! It’s always a huge hit… so thank you for that! I have another Thanksgiving event this year that I planned to make this for, but this particular group only eats organic. I was hoping to swap out the veggies this year with fresh green beans and potatoes. Any recommendation on cook time? Can you make head the casserole and freeze it . 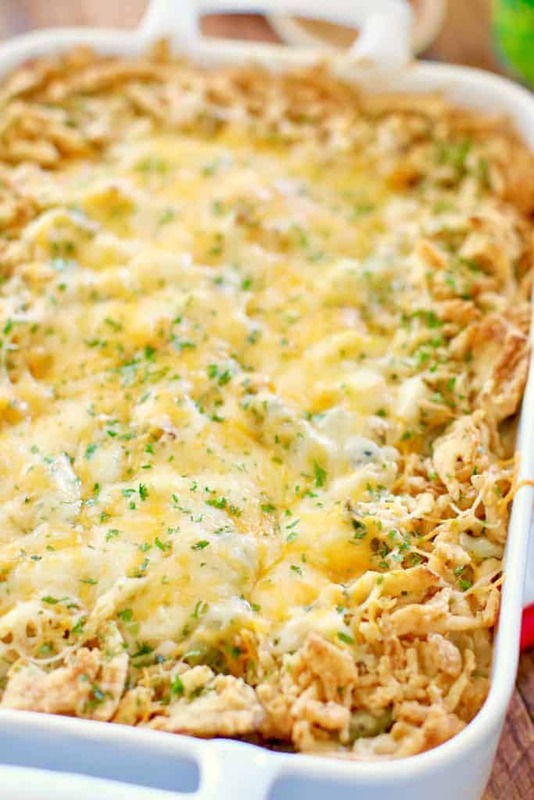 Never was a big fan of Green Bean Casserole, but I tried this for Christmas dinner and we all loved it. Really good.